Even as beauty editors who get a ton of beauty loot throughout the week, we still find ourselves poring through new products at the department store counters. (Who can say no to those gorgeous displays of lipsticks and perfumes?) And this month, Macy’s has given us reason to linger a little longer. Through May 27th, if you spend $35 or purchase two Lancôme products at any Macy’s, you will receive a complimentary Lancôme tote bag containing 6 of the brand’s best buys. To celebrate the promotion, Lancôme has invited us to join in on the action. This week we’ll be giving away a full-sized Visionnaire Advanced Skin Corrector ($89) to one lucky reader. The skin corrector not only hides pores and wrinkles, but also diminishes the appearance of UV damage and acne scars. 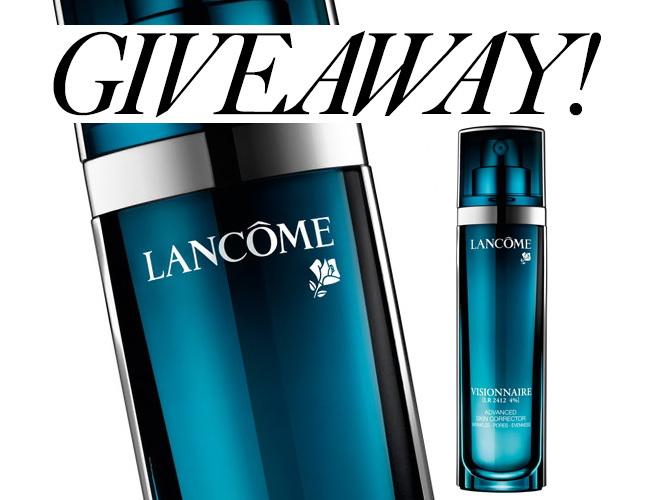 You can enter for a chance to win by following Daily Makeover and Lancôme on Twitter from Wednesday, May 15 at 3 p.m. to Tuesday, May 21, at 4 p.m.; We’ll choose three winners at random. Good luck! We’ll be accepting tweets through Tuesday at 4 p.m., and the winners will be chosen at random and announced by Daily Makeover via Twitter at 5 p.m.